The winning team consisted of Hunter Stone (Senior), MacKenzie Morrison (Senior), Laura Wagner (Senior), Angelica Osuch (Senior), and Cameron Vela (Sophomore). 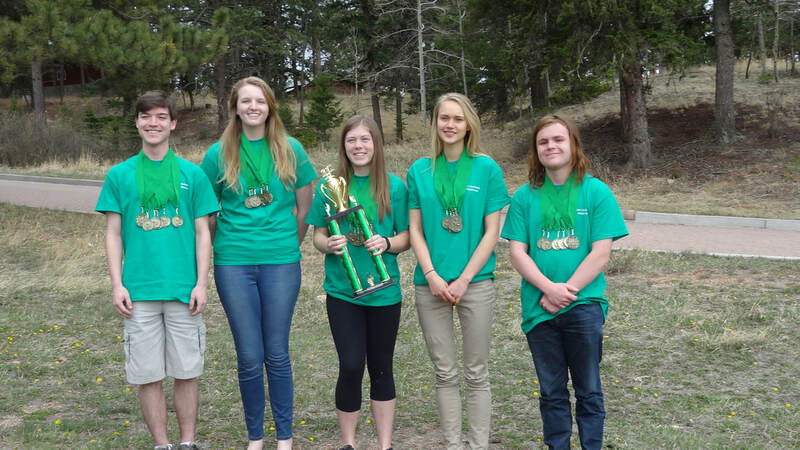 On April 25-26, 2017, Woodland Park High School sent two teams of five students each to compete at the Arapahoe County Fair Grounds in the state Environmental Science competition. Out of 10 teams competing, the two WPHS teams placed first and second. In addition, out of the six categories in the competition (Soils, Aquatics, Forestry, Wildlife, Agriculture, and oral presentation), WPHS took home the highest score in each category. The first place team went on to represent the state of Colorado in the North American Environmental Science competition this July. The teams are coached by Dan Ganoza, an environmental science teacher at WPHS, and Rose Banzhaf, who is not associated with the school, but has a passion for environmental science.